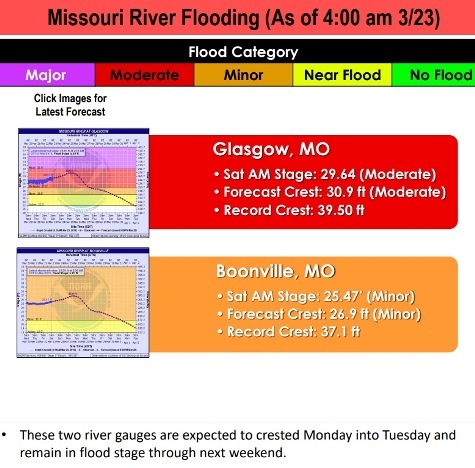 Missouri River projected to go into major flood stage in Wyandotte County today – Welcome to Wyandotte Daily! 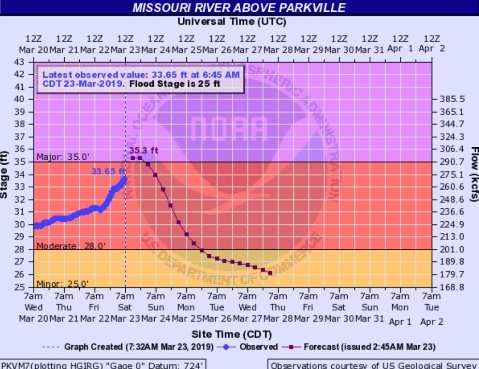 The Missouri River above Parkville, a gauge on I-435 that includes Wyandotte County, now is expected to go into major flood stage on Saturday, according to National Weather Service charts. 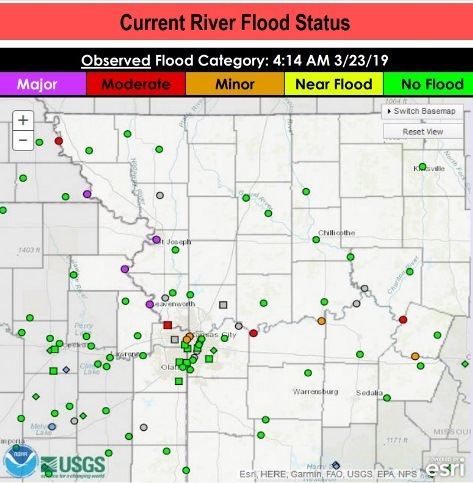 The river at that point was at 33.65 feet at 6:45 a.m. Saturday, and was projected to reach 35.3 feet around midday Saturday, according to hydrology charts. 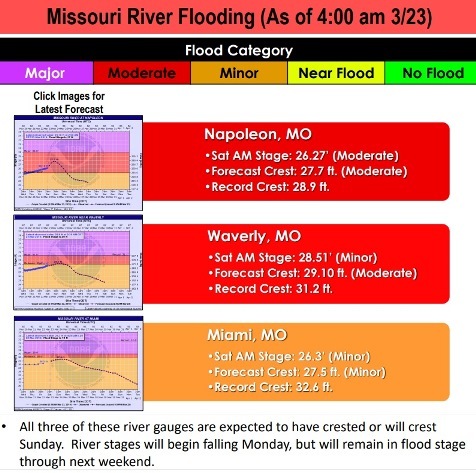 At 32 and 32.5 feet, the Wolcott levees in Wyandotte County, located south of the Missouri River near I-435, will overtop, according to the hydrology chart. 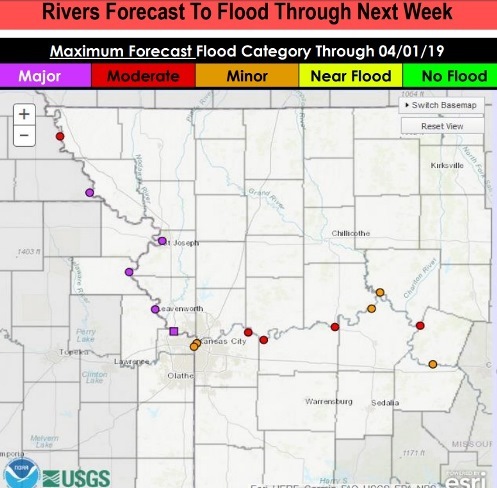 The Missouri River there is projected to decline and go back into moderate flood stage by Sunday morning, and into minor flood stage on Monday night, according to the chart. 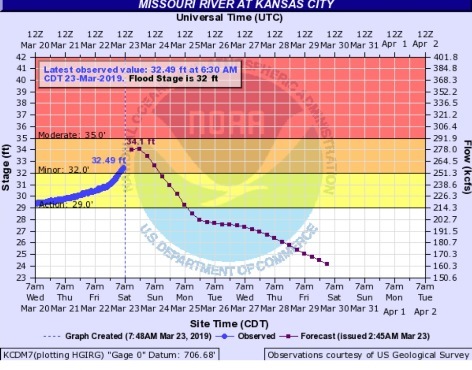 The Missouri River at Kansas City, a gauge located south of the downtown Kansas City, Missouri airport, has now gone into minor flood stage, according to hydrology charts. It was at 32.49 feet at 6:30 a.m,. Saturday, where flood stage was 32 feet. It is projected to crest at 34.1 feeton Saturday and then decline on Sunday, falling back to action stage during the day on Sunday. 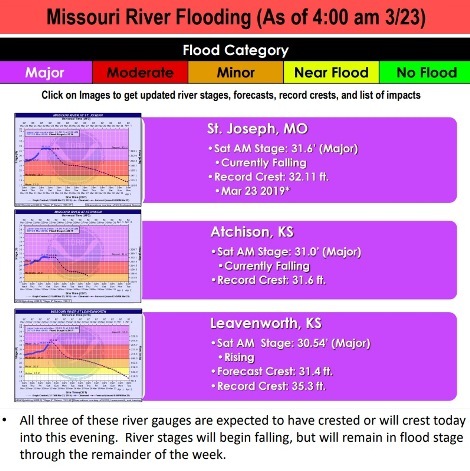 The 1993 flood reached 48.87 feet at this Missouri River site, and the 2011 flood reached 32.65 feet here, according to the weather service records. 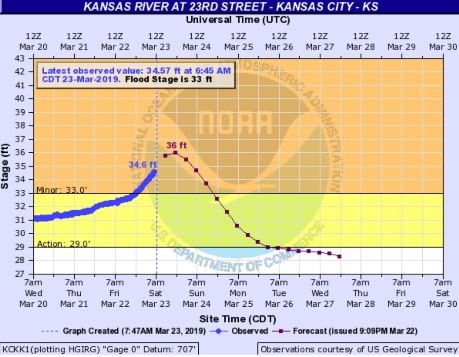 The Kansas River at 23rd Street went into minor flood stage during the last day and at 6:45 a.m. Saturday was at 34.57 feet, where flood stage is 33 feet. It is projected to rise to 36 feet on Saturday night, then fall back to action stage on Sunday night. This river gauge is located at Kansas Avenue and the state line, on a road that leads to the American Royal in Kansas City, Missouri. The 1993 flood reached 54.80 feet at the Kansas River at 23rd Street location, according to hydrology charts. The 2011 flood reached 34.53 feet at this site. Residents are warned not to drive through flooded roads, as vehicles may lose control in 6 inches of water and may be carried away in 2 feet of water. Motorists are advised to turn around and go back if they encounter flooded roads. Today’s forecast is a high near 58, and 70 percent chance of showers, with a tenth to quarter-inch of rain possible, the weather service said. A southeast wind of 7 to 14 mph may gust as high as 21 mph. Tonight, there is a 70 percent chance of showers with a low of 49 and a southeast wind of 13 to 15 mph, gusting as high as 22 mph, according to the weather service. Between a tenth and quarter-inch of rain is possible. Sunday, there is a 20 percent chance of showers and thunderstorms before 10 a.m., then a slight chance of showers between 10 a.m. and 1 p.m., the weather service said. The high will be near 60 with a southwest wind of 10 mph becoming west northwest in the afternoon. Sunday night, the low will be 42 with a north wind of 8 to 10 mph, according to the weather service. Monday, the high will be 53 with a north northeast wind of 10 mph, the weather service said. More rain is in the forecast for Wednesday night, Thursday night and Friday. 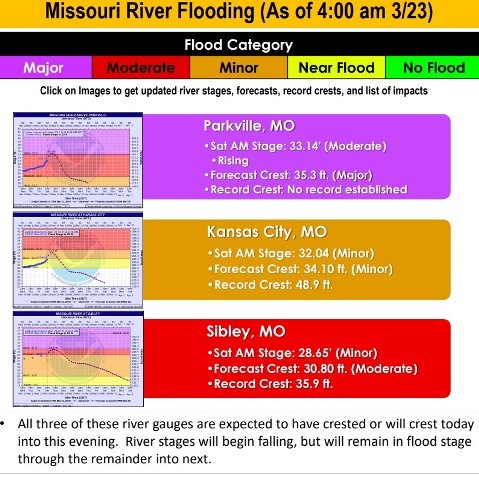 To view the hydrology charts, visit https://water.weather.gov/ahps2/index.php?wfo=eax. More weather information is at www.weather.gov.